What’s it all about? An excerpt from Where Do Ideas Come From? Many of my novels can be used as the basis for workshops and projects in the classroom. The Alchemist’s Portrait, The Sorcerer’s Letterbox, and The Heretic’s Tomb are all time travel stories and can be used as the basis for workshops in which students create time machines and stories set in a different era. All three novels are also ideal for studying the different historical periods depicted in the stories. The Alchemist’s Portrait can be the starting point for workshops using pictures for inspiration, creating stories based on artifacts found in museums, or for creating unique characters. The Sorcerer’s Letterbox might inspire children to learn more about the Tower of London or other medieval castles, as well as study the mystery of the Princes in the Tower, the Wars of the Roses, and medieval life. The Heretic’s Tomb can be used to learn about the Black Death, medieval society, the beginnings of healthcare, or the role of the medieval church. There are also strong female characters in the story and this can lead to students learning more about the very important women that lived in the Middle Ages. Teachers can use The Clone Conspiracy as a starting point for projects about the development of technology or what students might except to see in the world of the future. The Emerald Curse is an excellent novel for projects in which the students create their own superheroes and comic books. The Doomsday Mask can be used to study ancient civilizations, ruined cities, and the extinctions of animals that took place at the end of the Ice Age. The Time Camera lends itself to wonderful projects related to the history of photography, writing speculative stories about alternate history, and finding inspiration from old photographs. The Sphere of Septimus has a wealth of potential for projects in which students create their own fantasy kingdoms, along with the people and animals that inhabit their imaginary world. Where Do Ideas Come From? 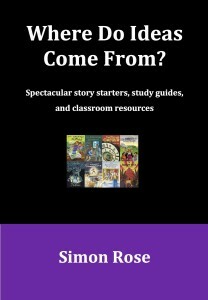 provides suggestions and recommendations for teachers developing classroom projects based on all the novels but might also serve as inspiration for aspiring writers of all ages. Where Do Ideas Come From? is available as an ebook and as a paperback on Amazon, Kobo, Barnes and Noble, iBooks, Smashwords and many other locations.